Note: This is the PCB only - You can get the specific RJ45 8-Pin Connector here or in the Hookup Accessories below! These are a really nice way to break out an RJ45 plug to 0.1" headers. Our FIRST Robotics team replaced most of our servo PWM cables with Cat 5 using these. Only comment: It would be nice it the board had two more holes in it so you could easily fasten it down to another surface. I just noticed that there is no way to attach these. What a shame that they don't have screw holes. I bought this along with the PRT-00643 connector and it seems that the breakout is 180 degrees out from the connector.... that is if pin 1 is the square pin. Or do I need to go back to school and learn my numbers and shapes? As noted by others, the pin numbers are backwards if you assume that pin 1 is the square pin. This is related to the RJ45 jack that is used. 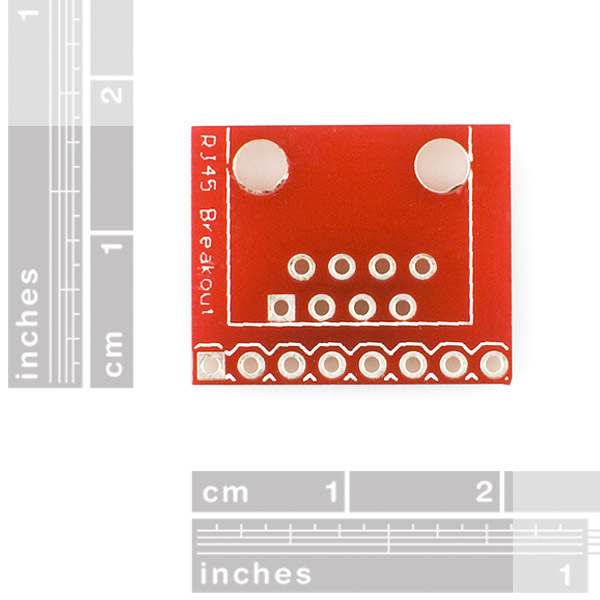 If you use the SparkFun PRT-00643 which has the locking tab at the bottom, the pins will be reversed (the square pin is pin 8). If you use a jack with the locking tab at the top the pin numbers will be correct. Works fine except the pin 1 designation (the square-shaped pad) is wrong, as noted by another commenter. The pins are in reverse: i.e. the pin 1 designation is actually designating pin 8. Anyone know the maximum continuous current that the traces on this board can handle? In other words, are the traces >= 24 gauge wire? So how have people attached these to their projects? Very nice! Easy assembly. Comes in handy for working with RJ45 for non Ethernet uses. Very handy! I have older versions of these that work great. 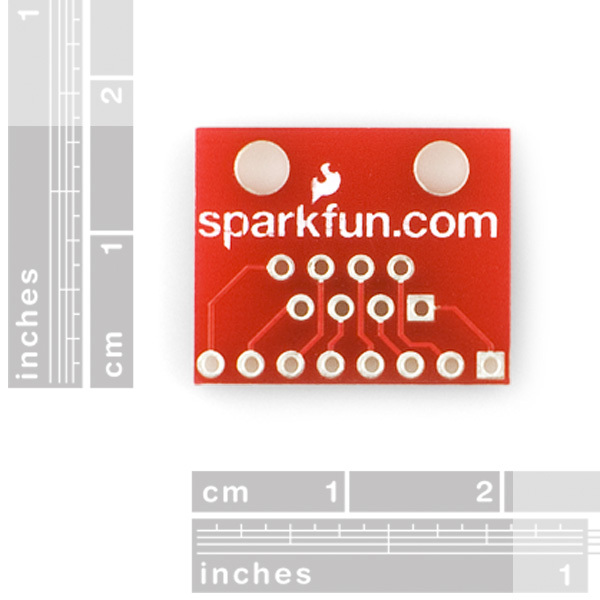 This works great with both the Sparkfun MagJack and Pulse Magnetics J00-00XXNL parts. Wish that board included the LED pins, with grounds routed together and 0805 resistor footprints on the board. That would make this a plug-in solution, as it stands I have to route this stuff myself. Kinda a hassle. Do you mean "breadboarding"? If not, what is breakboarding? This is a nice solid board. My only suggestion for improvement is to include mounting holes for mounting this to the rest of your project. The board quality is excellent. I find that all of the hole sizes are just fine, regardless of whether I am using a header strip or for Cat5 wire. I have several of them and continue to use them for various projects, just remark pin 1 and you are good to go. Uses minimal space, much easier to use than the previous version. Not much more to be said. Great for prototypes since the RJ45 holes don't line up with breadboards but I mistook the big holes for mounting holes. They are not. They are part of the RJ45 unit so there is no way to prevent this breakout from rattling around in a box. I really wish ALL breakouts would have at least one mounting hole, preferably two, that has no conduits on it. That way I could break/shave that section off I really needed to shrink it, but more importantly, they would all be SO much more useful in real projects such as robots, housings, etc. This breakout can be a little confusing, as the pin marked by the square is position 1 on the data sheet, but is actually pin 8 for an Ethernet cable - and the footprint used on this board does not match the RJ45 jack in the Sparkfun Eagle Library, which properly marks Ethernet pin 1 as the square pin, despite being position 8 on the data sheet. 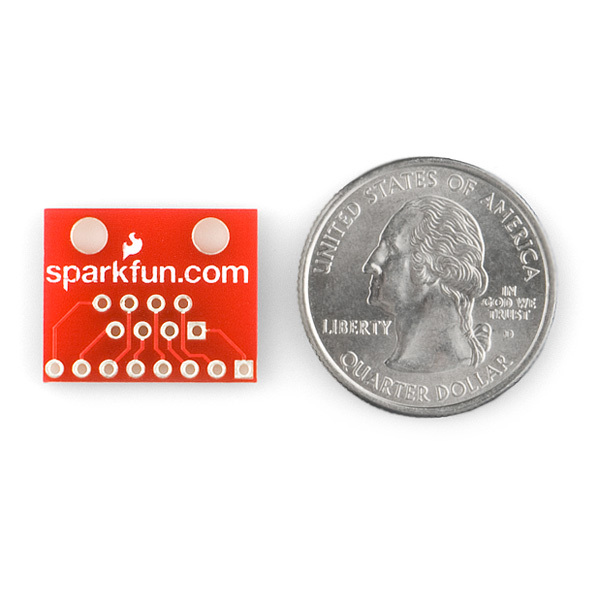 Other than that, the quality is everything you would expect from Sparkfun. I would only ask for another mm or so on the 1" pins to add a screw header on the top side. There's not much to ask for in such a simple breakout board, and this board works perfectly well. The only improvement I can think of would be a version that has some sort of mounting support -- tabs or holes, etc... I had to 3d print a custom holder to provide mounting options, which took a fair bit of work to design. The RJ45 Breakout Board allowed me to easily add a RJ45 Socket to my prototype. 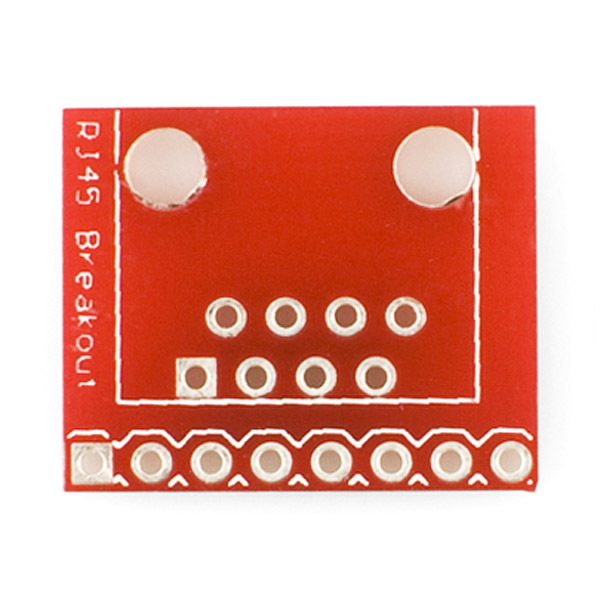 This breakout is a pretty simple one but is among the various things I buy from Sparkfun for my hobbies and it is, like everything else that I buy, the best that there is: high quality, easy to use, and most importantly, does exactly what it says it will do. Just what we needed and well made ... that about sums it up. RJ45 PCB connectors are great to use as quick disconnects for sensors and other devices on projects but the offset pins make them very difficult to prototype with. These little boards make integration easy. The breakout is in the order of the RJ45 contacts and has standard breadboard spacing. They were a little expensive @$1.95 but saw recently were they are now $ .95 and plan to buy more at this very reasonable price. Wish they had something similar for a 2x4 ICD connector. Grabbed a pair of these, attached two plain RJ45 jacks, and mounted the RJ45s to the PCB for one of my projects. I already have my next project for a pair of these lined up. The quality of the board is excellent. Great solution to a problem you didn't know you had! Be sure to buy the RJ45 connector and some header pins. 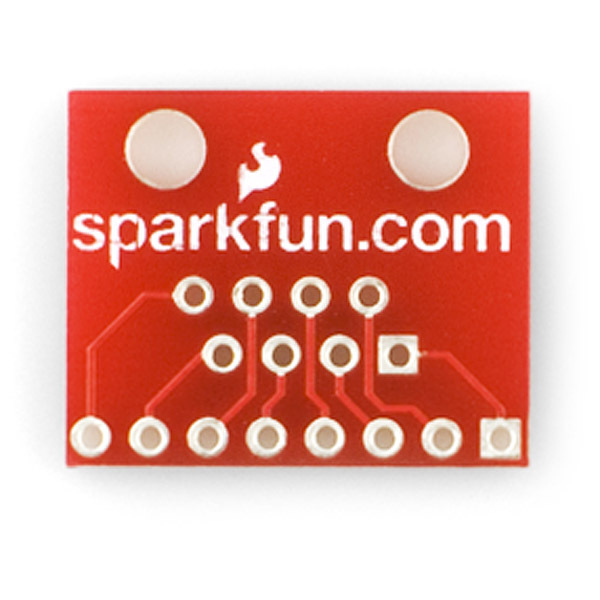 This is a slick solution to interfacing a breadboard project with the real world. 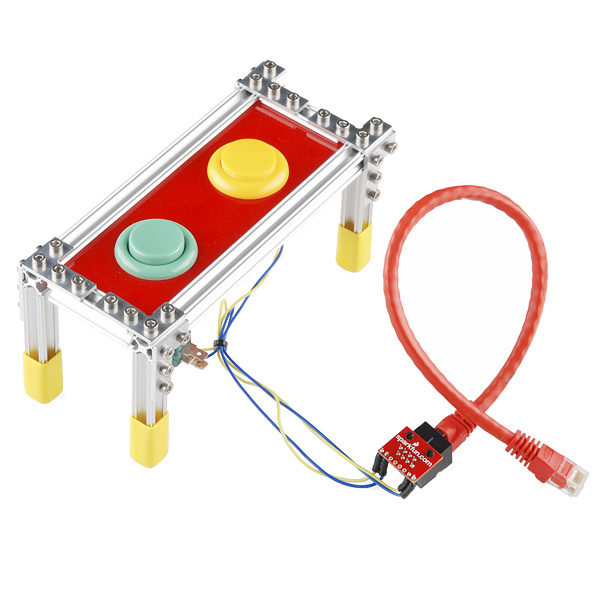 Great for testing remote sensors from the breadboard and using a RJ45 in the final design enclosure. I needed to build a prototype... but an RJ45 jack just won't play nice with a breadboard... until now.